"Private", Internet Photography by Paolo Cirio, solo show. 2016. NOME at 208 Bowery presents PRIVATE, solo show by Paolo Cirio with the themes of privacy and surveillance related to ownership and circulation of personal photos over the Internet. The solo show PRIVATE is coincides with Paolo Cirio exhibition at ICP Museum for the exhibition Public, Private, Secret, featuring the Overexposed series at the entrance of International Centre of Photography Museum on 250 Bowery street. Cirio’s Internet art practice is condensed into artworks with bold visual impact, sophisticated concepts, and historical significance. The works featured in PRIVATE interrogate the contemporary role of images and the making of cutting edge art photography through hacking and coding. Modes of dissemination, appropriation, and technical reproduction of images are integrated into these Paolo Cirio’s Internet Photography artworks. 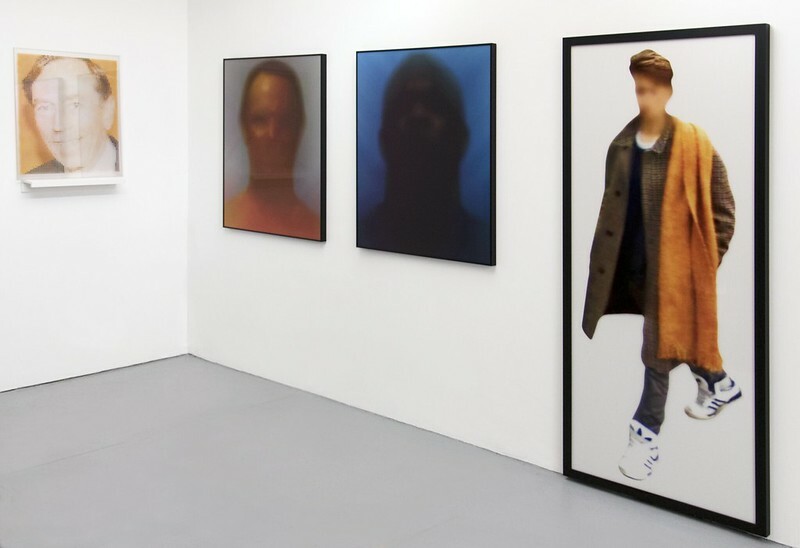 The work Obscurity is a selection of printed mugshots, which were appropriated from the Internet and manipulated by a custom-made algorithm to make the individuals unrecognizable using an unique visual effect. The works will be premiered for the firt time, they derive from the artist’s online performative hack made with over 15 million mugshots of people arrested in the U.S. that have been obfuscated to protect their privacy. The Obscurity series will be exhibited at the Ars Electronica Museum in Linz in 2016 and at the Musée National d'Histoire et d'Art of Luxembourg in 2017. The works Keith Alexander and David Petraeus are appropriated selfies of the former directors of the NSA and CIA. The online photos have been enlarged and spray-painted on paper and plexiglass using an HD graffiti stencil technique developed by the artist. The work are from the Overexposed series of portraits of high-ranking U.S. intelligence officials who have been involved in mass surveillance programs or have misled the public about them. The series has been featured on Reuters, ZEIT, Frankfurter Allgemeine, Süddeutsche Zeitung, Arte TV, and many other media outlets. Overexposed was exhibited at Centre de la Photographie in Geneva, the ICP Museum in NYC, and it will be exhibited at the Palazzo delle Esposizioni in 2016 in Rome, Muncher StadtMuseum in Munich and at C/O Berlin in 2017. The work Street Ghost is a photo appropriated from Google Street View and printed at life-size scale. The work is from the Street Ghosts series in which photos of people found on Google Street View were printed and posted at the same locations where they were taken. The artwork re-contextualized readymade online material and documents shifting social norms and policies concerning privacy. The series has been featured in the Atlantic, Libération, El País, O Globo, the Daily Mail, and several others publications. Street Ghosts was exhibited in many art institutions including at the Open Society Foundation, NYC, the MCA Denver, and it will be exhibited at International Kunstverein Luxembourg in 2016, Museum für Fotografie in Berlin and the Haifa Museum of Art in 2017. Archival inkjet on 350gsm paper. Acrylic paint on clear plexiglass.